The Sooners, Mountaineers, No. 13 Texas and No. 18 Iowa State are the final four teams still in contention for the two spots in the Big 12 title game Dec. 1. There are also two big head-to-head matchups the last two weekends of the regular season before then. Three-time defending Big 12 champion Oklahoma (9-1, 6-1 Big 12) or the Mountaineers (8-1, 6-1) advance by winning their last two games. 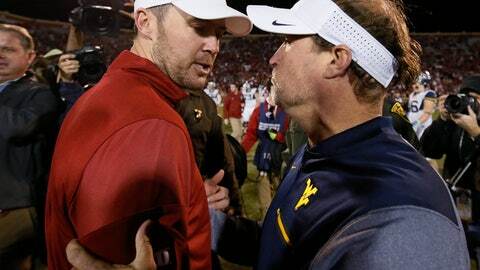 Since they play each other in the regular-season finale, it is impossible for both to finish 8-1 in conference play, but they could also still face each other two weeks in a row — the day after Thanksgiving in Morgantown and then for the Big 12 title in the home of the NFL’s Dallas Cowboys. “We’ve got a lot of big goals and our goals are kind of predicated on us playing our best ball here at the end of year,” Sooners coach Lincoln Riley said Monday. Every Big 12 team plays each other in the round-robin conference schedule that sets up one rematch for a guaranteed spot in the New Year’s Six bowl game. And if Oklahoma or West Virginia win out, they could possibly make it into the College Football Playoff. Iowa State (6-3, 5-2) plays Saturday at Texas (7-3, 5-2) in what will be their only meeting this season. There is no possible scenario that could create a championship game rematch between the teams currently tied for third place. The Cyclones have won five Big 12 games in a row for the first time in school history. That has come since opening conference play with losses to Oklahoma and TCU, the teams that played in last year’s Big 12 title game after both lost to Iowa State in the 2017 regular season. Since a 37-27 win at Iowa State in mid-September, Oklahoma has scored at least 45 points in each of its last six conference games. But the Sooners lost 48-45 to Texas, a setback that would keep them out of the Big 12 title game if it came down to a head-to-head tiebreaker between the Red River rivals. West Virginia’s only loss was a month ago at Iowa State, but the Mountaineers won 42-41 at Texas when quarterback Will Grier ran for a 2-point conversion in the final minute. That means opposite tiebreaker scenarios against the current co-leaders for the Longhorns and Cyclones: Texas over Oklahoma; and Iowa State over West Virginia. Kansas (3-7, 1-6), the only Big 12 team so far that can’t get bowl eligible, is also the only team that will finish the regular season against two of the title-contending teams. The Jayhawks are at Oklahoma on Saturday, and host Texas in their finale Nov. 23. Oklahoma has won 13 consecutive games against the Jayhawks by an average margin of 31 points, and its last home loss in the series was 1996, the first Big 12 season. Kansas is 1-14 against Texas in the Big 12, though the Longhorns lost in their last visit to Lawrence two years ago. Home vs. Kansas, Saturday; at West Virginia, Nov. 23. Beat Iowa State 37-27 on Sept. 15; Lost to Texas 48-45 on Oct. 6. At Oklahoma State, Saturday; home vs. Oklahoma, Nov. 23. Lost to Iowa State 30-14 on Oct. 13; Beat Texas 42-41 on Nov. 3. Home vs. Iowa State, Saturday; at Kansas, Nov. 23. Beat Oklahoma 48-45 on Oct. 6; Lost to West Virginia 42-41 on Nov. 3. At Texas, Saturday; Home vs. Kansas State, Nov. 24. Lost to Oklahoma 37-27 on Sept. 15; Beat West Virginia 30-14 on Oct. 13.